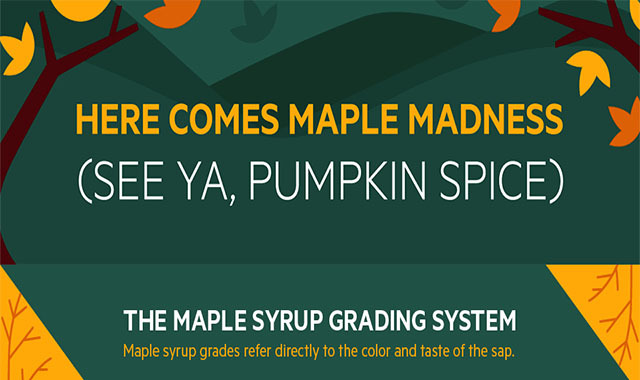 Here Comes Maple Madness (See Ya, Pumpkin Spice) #infographic ~ Visualistan '+g+"
Pumpkin spice has long ruled supreme as the go-to flavor for brisk fall days and sweater weather. But according to recent market trends, another fall flavor is surging: maple syrup. Unlike the often artificially flavored pumpkin spice syrups used in coffee and baked goods, 100 percent maple syrup is a mineral-rich alternative for health-conscious consumers looking for cleaner fall treats. While maple syrup is still a sugar, it offers more nutritional benefits, including zinc, magnesium, calcium, potassium, and riboflavin,than many other sweeteners. There are a range of maple syrup grades, all with different flavor profiles—from delicate and smooth to rich, woody, and roasted. Since this one-ingredient powerhouse has so much to offer, it’s easy to see why many companies are adding more maple-flavored items to their repertoire.